I’ve read all of Guy Gavriel Kay’s previous novels and enjoyed them all (even if some are better than others) so bought this soon after it was released. Like a lot of his previous books Kay has decided to set the story in what is ostensibly a fantasy world but one that maps very closely to real history (to the extent that individual characters and places are often identifiable even if under slightly different names) with some minor supernatural elements added. This book is in many ways a follow-up to his Sarantine Mosaic duology (which I think is one of Kay’s best works) which was set at the height of Kay’s world’s equivalent of the Byzantine Empire. 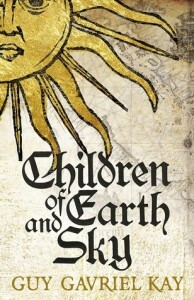 Children of Earth and Sky is set many centuries after the Sarantine books, shortly after the great city of Sarantium has fallen to his world’s equivalent of the Ottoman Empire who now threaten neighbouring nations with much of the story taking place in the mercantile republics of Seressa (Venice) and Dubrava (Dubrovnik) as they try to trade with both sides in the conflict. I don’t really know much about the period of European history Kay’s book is based on, so this is an unusual fantasy book where I’ve feel like I’ve learned more about actual history from reading something not technically set in our world. While it’s not really necessary to have read the Sarantine books to follow the plot in this there are some nice references to the previous series scattered throughout the book and it does revisit some familiar locations. I’ve always liked Kay’s characterisation and this time around he does seem to have avoided some of his past excesses about having characters who are supremely talented at everything they turn their hand to. I thought there was some really good character development here. The idea of heroism seems to be one of the main themes here and Kay does a good job of showing characters who may in some respects be genuinely heroic and morally ambiguous at the same time. There is a good variety of characters here as well, while the two main female protagonists may be very different they both find their own ways of making an impact on the world. I did think this book took a while to really get going, the first hundred or so pages seem largely devoted to introducing a large cast of characters in a variety of settings and they can initially feel a bit disconnected. One thing Kay does well is showing how suddenly violence could break out in such a world, and it’s after one of those abrupt outbreaks of violence that I thought the book started to become compelling. Overall the book is more focused on character interactions and political intrigue than action but when required it does deliver some compelling action scenes with a forest ambush and a desperate rearguard action against an invading army being particularly memorable. Although this isn’t a book with a single straightforward plotline I think Kay did a good job of weaving the different plotlines together so it feels like a coherent novel and although the ending, like real history, doesn’t tie everything up too neatly it does offer enough of a conclusion to be satisfying. Overall, I’d probably rank this not far behind Kay’s best books, other than taking a while to get going I don’t have any major criticisms of it.